Backstroke is the stroke with the most striking similarities to freestyle (one is sometimes called front crawl, the other back crawl). It's also the most restorative and relaxing to swim . 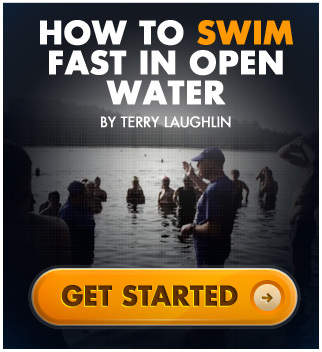 . . if you swim it the highly efficient way taught by Total Immersion. But most people swim it more like a semi-sinking windup toy. You'll get amazing results if you follow the TI Efficiency Pyramid of Balance > Streamline > Propel, as we do in the four learning steps in our Backstroke Made Easy Self Coaching Course. 1. Balance and mold your core body into a low-drag torpedo shape. 2. Move your head-spine line through the water straight as if being towed by a line atop your head. Rotate your core-body around it. 3. Form long, 'slippery' lines from fingertips to toes on right side and left side. Switch from right-side to left-side line without disturbing the water. 4. Connect your strokes to the action of your core body. These skills are so similar to the efficiency foundations of freestyle that you can improve your freestyle by working on them in backstroke . . . and vice versa. A smooth, relaxed backstroke can also help you build your capacity for effortless distance. Swim freestyle for as long as you stay efficient. Then take a rest break with a length of relaxing backstroke before resuming freestyle. c.	Dozens of succinct on-screen coaching tips.